Don't worry too much about the dimensions. I simply started with the scalloped square, then figured out what size the patterned paper would work as. In this case, I used the largest square nestability, and the squares end up measuring 1-3/8 with the mat. 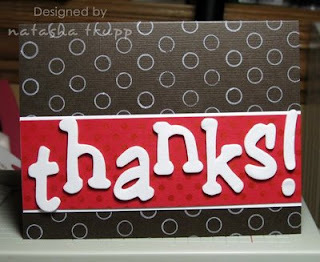 When I went to place the sentiment, I realized that neither white craft ink or chocolate ink would show up well over the patterned paper. I tried a slightly different approach. 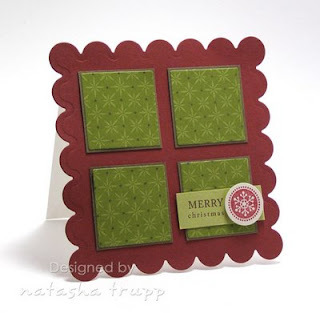 I stamped the greeting on a piece of Spring Moss, stamped a snowflake on some vanilla cardstock, punched that out, and pieced it together nicely over the square. I like how that turned out. One fun thing about this sketch is you can really make it as simple or complex as you want. 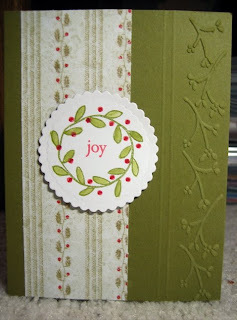 It was somewhat inspired by last year's Fall/Winter Stampin' catalog cover. That one is an example of just how complex this layout can be. 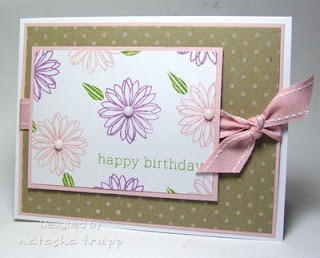 My card, however, is an example of this layout at it's simplest. 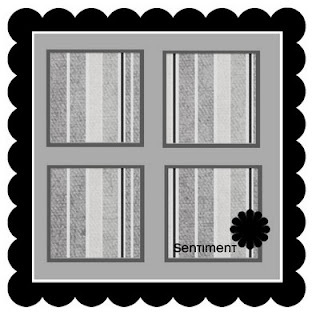 Feel free to add in a square layer behind the 4 squares, use more than one type of patterned paper, add more embellishments, have fun with it! I love anything to do with scallops. It's great that they are so trendy right now (and that doesn't seem to be changing!). There's just something very classic about adding a scalloped edge. It works well with squares or circles or simply an edge of something. 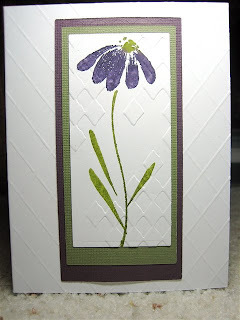 For my card today, I started with a navy card base. I ran that through the cuttlebug with a long scalloped rectangle nestability (one could easily use scalloped scissors or a punch to get the exact effect). 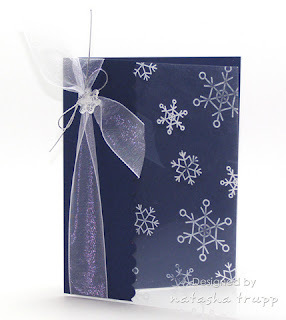 Next, I stamped some acetate with snowflakes. 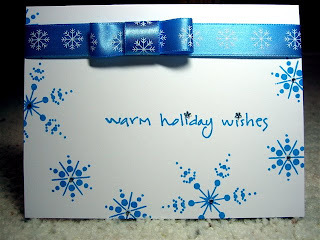 I attached that inside the card, then added some ribbon, silver cord, and a snowflake shrink charm. Pretty quick! 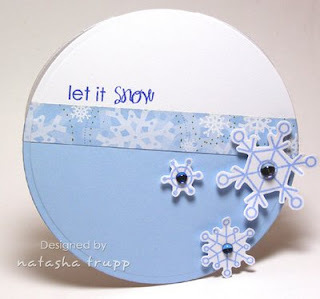 There's no sentiment just yet, I figured a nice saying stamped in white or silver would look nice peeking through the snowflakes. This week I bring you a somewhat deceptive 10 minute card. It looks more complex due to all the different patterns and layers involved, but it's really quite quick. 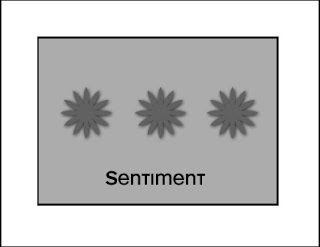 First off, the 3 flowers are all one stamp, so that's easy enough. 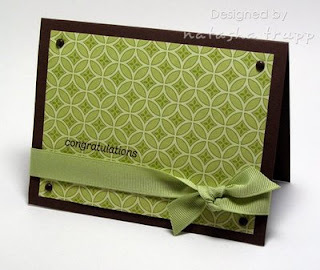 I stamped that and the greeting onto a linen stamped background vanilla panel. The background papers were based off of scraps I had on my desk. I wanted the green pattern to pop out a bit more, so I mounted that on some orange. The real reason this card came together so quickly is due to the proportions. Although the main panel isn't directly proportional to the card front, it's close enough. I decided on the proportions first, found a stamp to fit into those proportions, then chose colours based on the theme. It may seem a bit backwards, but I find that using this approach makes for a quick-to-execute project! 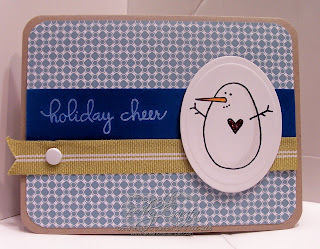 The sentiment is stamped in white craft ink, and the snowman's heart is actually christmas red stickles. Alright, here are my cards. I had them finished before today, but I forgot to set up my scheduled post, oops! This first one I made first, then designed my sketch to match. This gold American Crafts ribbon served as my inspiration. 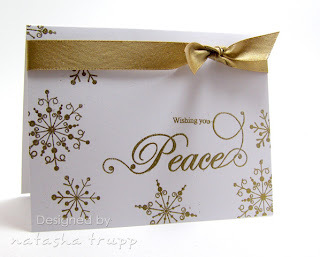 The snowflakes and the sentiments are all embossed with gold powder. My second card features some very basic watercolouring. 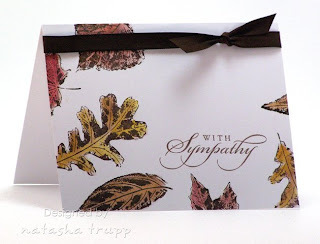 I stamped the leaf prints with Stazon on, then went over them with twinkling h2os. Added the sentiment and some brown twill and that was that. 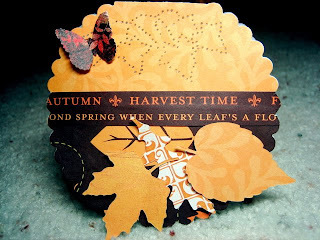 I find that when keeping things to the one layer, you need to bring in that extra "pop", either in the form of colour, shimmer, or a dimensional point of interest (whether really, like in the case of ribbon or embossing powder, or perceived, say if I had outlined or added a shadow to the leaves). Thanks for stopping by, if you decide to play along, feel free to leave a link in the comments or use the keyword FTL17 over at SCS! Have a good weekend! Here's the sketch, my samples will be up after 2:30 CST. When I was going back through the older posts, I kind of couldn't believe that I hadn't focused on pattern paper. I was sure I had (maybe I did but missed it...) Anyway, if it is a repeat, it's because it's that much of a staple in CAS stamping! 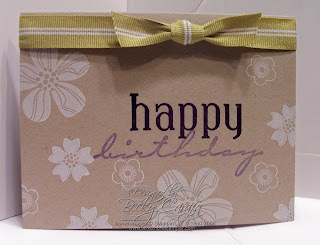 Patterned paper can stand alone with a bit of ribbon and a sentiment (as Monday's card showcased), it can also be added as a form of an embellishment. Sometimes it simply gives you a starting point. A certain combination of patterns, images, or colours can be just the right source of inspiration to get that creative mind going! That's actually what happened with this card. I LOVE the Haiku paper (so much so that it may very well be a pack that I purchase again, which is quite the rarity for me!). I love the repeated patterns and the fresh combination of colours. I grabbed a piece of paper, and used the colours as my starting point- Tangerine and Saffron. Throw in a bit of white and you've got a sharp colour combination! 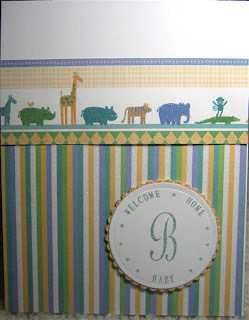 To really make the silhouettes pop I embossed them with white and added a white rub-on sentiment. 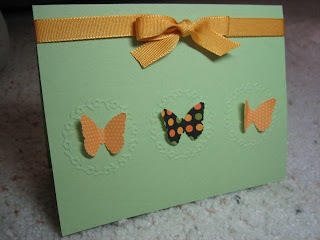 The card base is made from textured white cardstock. 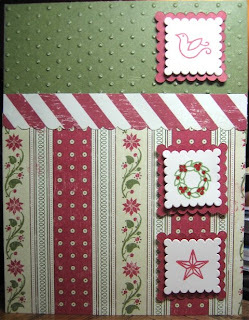 I've been doing this online scrapbook class and this week's topic is repetition. Perhaps that is what inspired me to pull out this layout! 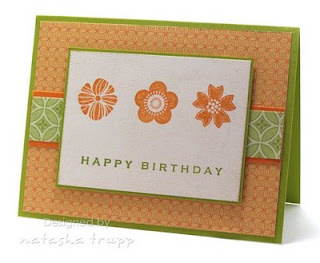 It's such a great way to bring a card together, simply by repeating 3 of the same thing! 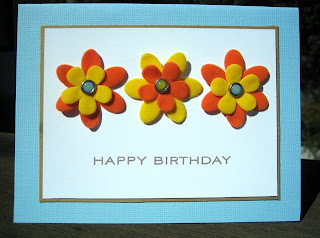 Here's my card, I was in the mood for something cheerful and vibrant. 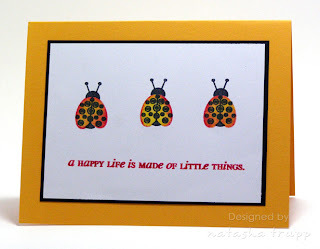 I went with a mix of Summer Sunrise and Pure Poppy on the ladybug bodies. The touch of black really pops the colour nicely. 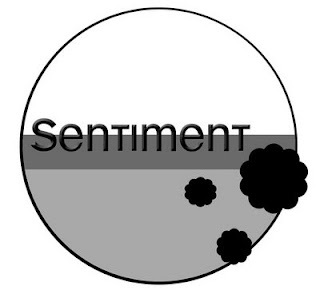 When I used this design most recently, I made 4 different versions. I promise, this is the last one. It's funny, even though they are all the same design, they all have very different looks. That's actually what this post is about- focus on the flowers! 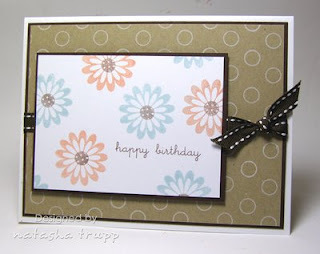 By changing the type of flower and the colours you use you can really alter the look of any card! Here I went with an almost Spring theme, since I chose light pink, purple, and olive. The great thing about flowers is how easy it is to achieve different looks. You could make clusters, watercolour the images, do some masking. I suppose you can do these things with any images really, but I find flowers are always so inspiring! There's SO many options out there it's crazy. It's also one of those themes where you can already own several flower sets, but a new one will catch your eye, because just like flowers, floral stamp sets off something new and unique with each design! Happy Thanksgiving to my fellow Canadian readers! Hope you're enjoying the day. I whipped this card together in under 10 minutes this morning. It helps when you have stamped images lying around- no that's not cheating, just being resourceful! I cut out the image, added a rub-on, cut out some scallops and adding a bit of ribbon. Done! I LOVE this colour combo-riding hood red, pink pirouette, and chocolate chip. It's just beautiful. I can see it working quite nicely for valentines later. Supplies: Stamps: Eastern Blooms Paper: Riding hood Red, Pink Pirouette, Chocolate Chip, White Ink: Chocolate, Riding hood Accessories, etc. 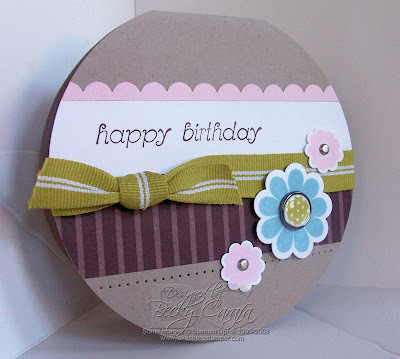 : scalloped rectangle die cut, chocolate ribbon, Hidden Garden rub-ons. Well, I hope you all liked my layout from earlier in the week because it's my sketch this week. This one truly is a fall-to layout for me. I use it ALL the time! It's got enough elements that make it interesting. There are also several possibilities with those elements. 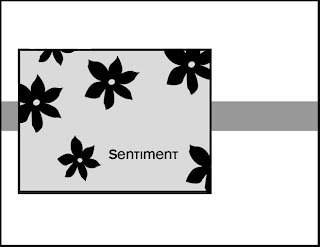 You don't have to use flowers on the main image panel, but I know there are lots of options out there for floral images. So here's another version of this layout. 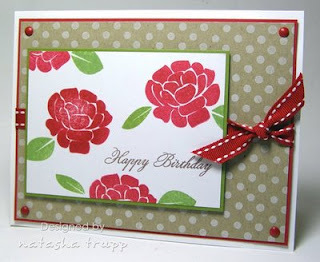 I used the polka dots to make a subtle background, then chose nice, bright colours for the flowers. Well last week was stripes, so it seemed appropriate to focus on dots this week. In case you haven't already noticed, I have been loving my new set of Polka Dot Basics. This is one of those sets I kept putting off getting since it didn't seem as "fun" as some other releases. It's such a staple, it's so nice to have access to such a wide variety of dot backgrounds! I started with a very basic white ink on a kraft background and went from there. I brought in a few flowers from Garden of Life, and I made a whole bunch of cards. They all have the same layout, but by changing the size of the dot background, the flower stamp, and the colours, they all look very different! 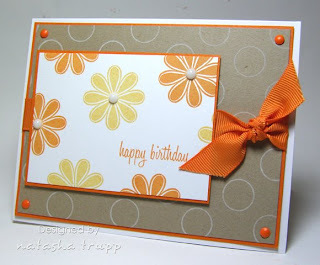 My card today was inspired by one I spotted in PaperCrafts 101, on page 131. It featured white letters and a stamped background. 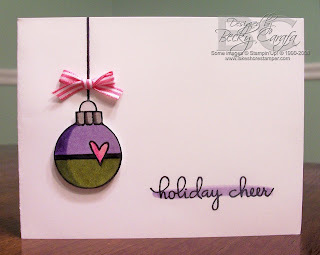 I changed the size of the card, didn't add any embellishments, and I changed the colours. It's nice when you can be inspired by the publications around you. I don't like to copy, but I spotted this one and thought, hmmm, I like that! I found my white foam alphabet stickers and a few dot stamps and got to work! The largest circle is almost 4 inches across. So I cut my base to 4x8, folded it in half, then cut leaving a space of nothing right above the fold (so as not to cut the folded paper into 2 separate circles). Next, I got a 4x4 square and made my card as if it was a square. I adhered the blue paper, then the strip of patterned paper. Next, simple cut out the circle card front from that. You only have to make 1 cut and everything is exactly where you want it! No lining up curved layers. 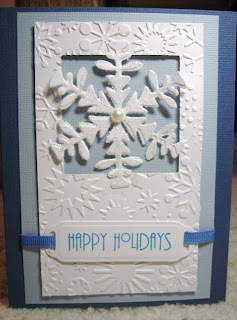 The rest of the card was quite simple, stamp 3 snowflakes, cut them out, add gems and attach with pop dots. 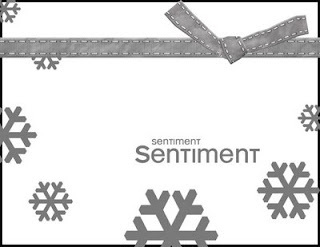 Stamp a little sentiment. Done! 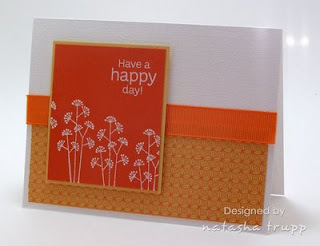 Happy World Card Making Day!!! !